There was a big noise in our garden yesterday. Lots of crows are currently nesting in the big trees around us and two seemed to have decided to have an argument right in our garden. However, when I checked, I realised there was a third bird involved - slightly smaller and with white on its wings. The noise kept on during the day and by the afternoon I had enough and the little bird had been scared by the other two so much you just had to feel sorry for it. I decided to call the RSPB, however there was no getting through on their phone line so I called the RSPCA emergency line instead. They were very helpful and promised to send someone round as soon as they could. 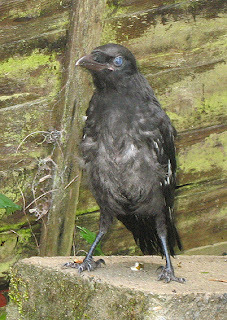 I hadn't been sure that it was a crow at all at the beginning when it was hopping around in the undergrowth trying to escape the other two birds, however, when I got a closer look, I realised that it was a fledgling crow, although the white feathers on it's back are still quite unusual. You can just see them peeping out in the pictures above. 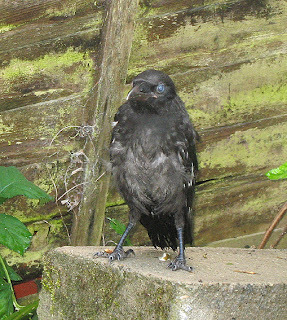 The kids decided to call the crow 'Craig' as a bird needs a name, especially a little one looking so sorry for itself. Late this morning the lady from the RSPCA arrived and managed to catch it with a net. Her conclusion was that it might have been thrown out of the nest either by its own parents or some other birds because of the white feathers. Apparently, a crow has to be black. Nothing else will do and nothing else will be tolerated. Poor little thing. The lady from the RSPCA promised to feed it in her van (we'd given it some cat food last night, but it was still quite thin) and then to take it to the Wildlife hospital. Fingers crossed, Craig will be fine. Went to London on Tuesday with Penny (Natural Attrill) and her son Toby. Before we met up with the two of them at the V&A Ben and I went to Covent Garden to look at all the craft stalls and have some lunch. Couldn't resist to buy some things. One of the things I bought was a little box with wafer thin soap roses in white, that smell of lavender and lemon. 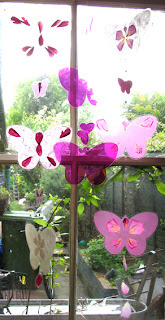 The other thing was a mobile of pink perspex butterflies. 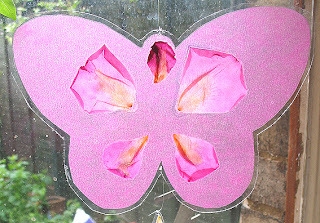 I hung it up on the curtain pole next to my computer and it looked very pretty, but very lonely. 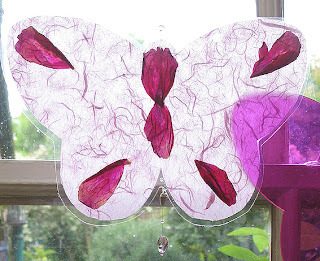 So, I decided to play with my new laminator, some rose and peony petals from the garden, handmade and tissue paper and invisible string - oh, and because it's me, there had to be some beads, too. 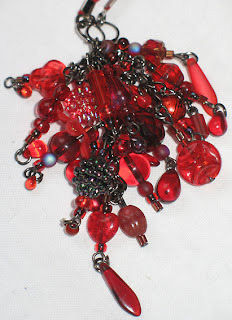 Here's a picture of what I made - light wasn't brilliant, but I think you can still see. The one I bought in London is in the middle. Been busy this weekend, but especially today. 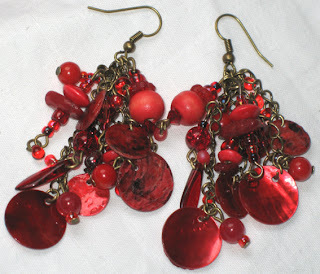 Have been asked to make some earrings in red and gold/yellow and here they are. 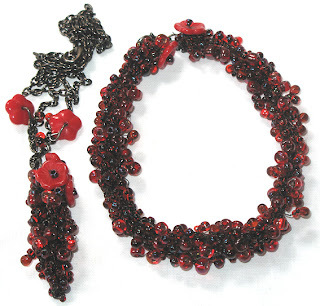 I've used lots of red beads: red shells, red jade, coral, wood, Magatama and Miyuki drops, carnelian, cranberry crackle beads, flower beads, Swarovski crystals (Siam and Papadasha), and seed beads in different shades of red on bronze findings. 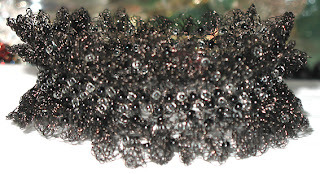 The close-up below shows the beautiful beads in detail. For this pair I have used warm golden and cream shells, topaz, citrine, and amber, wood, Miyuki cubes in different shades (copper, gold and yellow), Magatama and Miyuki drops, Swarovski beads in different shades of yellow, from intense to pale lemon, little stripy heart beads and glass and seed beads in different shades of yellow/gold/amber/topaz. 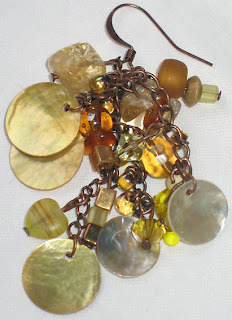 The whole lot has been strung on copper with two different types of chain. Here's the third commission. 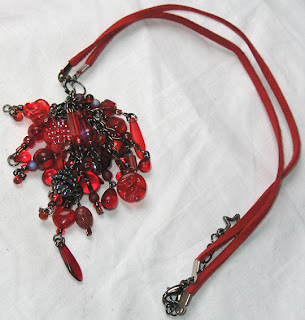 A necklace with a cluster of beads hanging from a gorgeous deep red suede thong. There are too many beads to list. The picture below shows more detail. I've been playing with hemp and I wanted to make something totally unique and very organic. 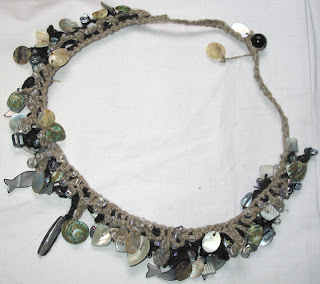 The necklace below is made with natural (not dyed) hemp and black hemp. I've used crochet to hold it all together and started with just a chain of crochet, then added a row of half crochet. This was my 'frame' so to speak. 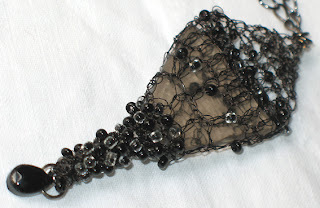 Next, I created a layer of whimsical crochet lace with beads all in the natural coloured hemp, which I then followed with more crochet, lace crochet and beads underneath the original layer but this time in black. 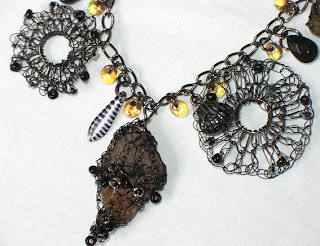 Here's the detail shown from the 'day' side of the necklace. 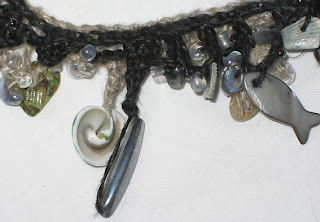 I've used mainly shells in light greys and greens and clear lustred beads. This is the necklace from the 'night' side. 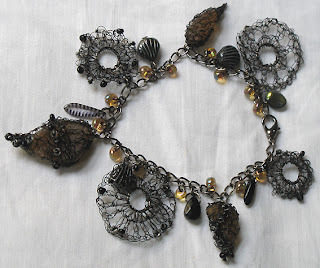 On this side I've used mainly darker grey shell chips, dark grey lustred stone and little dark grey mother of pearl fish with a beautiful 'stick' pendant with a lustre to it as a centre piece. The necklace looks completely different dependent which side is on view. My jewellery party went well last Thursday and I had to make some more sea glass earrings to go with the jade heart necklace (see previous posts) which I sold at the party to my friend. 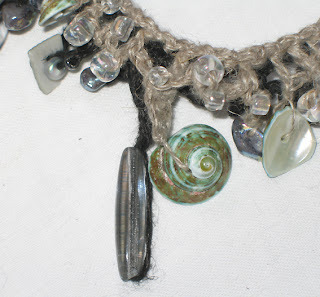 It took some time to find two matching pieces of sea glass where the colour also matched the necklace. 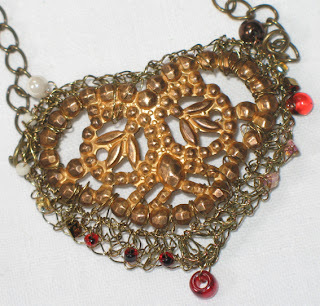 I added the filigree bronze beads to recreate the cone shape of the bead cap I used for the necklace, which would have been too big for earrings (I think). I added crochet and some more jade hearts. 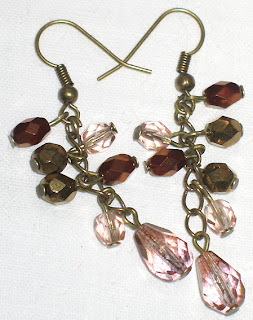 The same friend bought the rose vintage necklace a while back but she wanted some earrings to go with it. Below is the result. 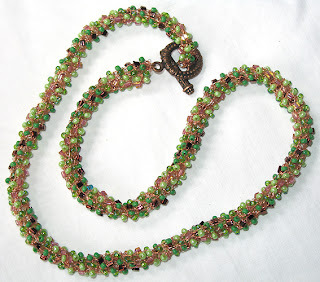 I love the soft sheen of the vintage beads and the colours work beautifully together. I just had to make some more. 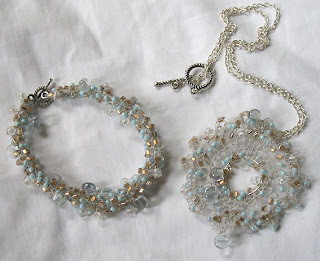 :-) This wire crochet is definitely addictive - check out Caroline's Blog, she can't stop either! Below is my kite necklace. The colours reminded me of that moment by the seaside where the sun has almost sunk and there are just a few glimmers of light but everything else seems to be painted in sepia. I've used black enamelled copper wire with small seed beads in black and crystal/black lined with a pale amber bit of sea glass and a lovely faceted drop. 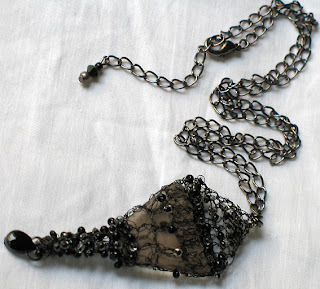 The chain and other findings are black plated. The bracelet below has really captured me. I love it. I am pretty sure I can't bear to part with this. It's just so beautiful. I've combined little pendants/charms of wire encased amber sea glass with amber lustred Magatama drops, little wire wheels (each one different), and little glass bead drops and shells. The feeling is slightly - maybe more than slightly LOL - Gothic and very filigree, almost like Art Nouveau ironwork. I love the effect and it hangs beautifully. Below are some earrings to go with the necklaces/bracelets I made. They will be sold separately so people can pick and choose what they want. 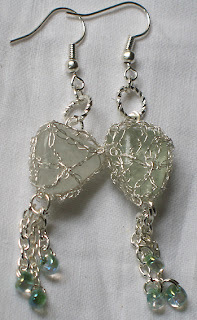 The first set has been made with pale green sea glass and silver plated copper wire and silver plated findings. 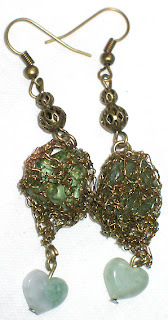 I've added some pale green lustred Magatama drops. I love the watery feel of these earrings. These ones would go well with the Mermaid necklace. 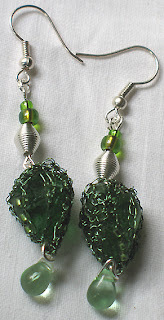 I've used a similar medium green sea glass encased by green wire plus watery green glass tear drops, a few seed beads and some wire beads. These are really lovely. They would go perfectly with the seahorse necklace. 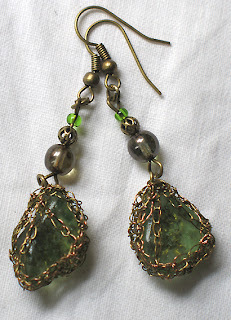 I've used dark green sea glass with a bronze coloured wire, gorgeous lustred beads, bronze filigree beads, and a couple of green seed beads. 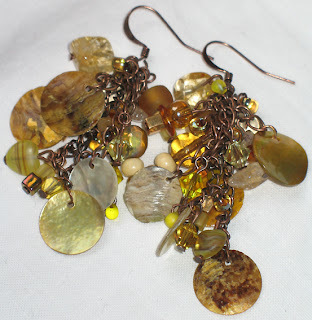 These earrings are simple but the effect is lovely, very organic. 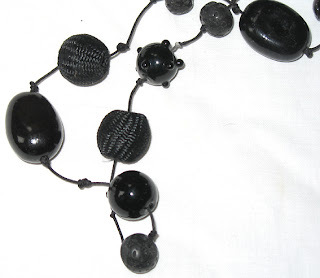 The first one is a flapper I made with black silky cord, magma and woven beads, Indian lampwork beads, and some large black stone beads. I can't remember what they are - they have a funny name. Initially, the necklace was for me (in case you hadn't noticed, I like black LOL), however my friend really liked it so it's reserved for her for my jewellery party next week. 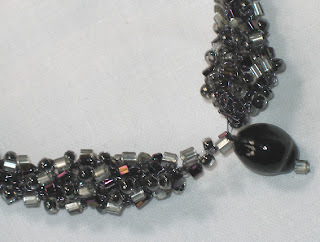 Here you can see some of the beads in more detail. 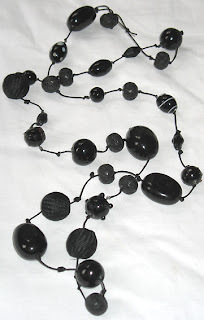 I love the silky quality of the woven beads next to the smooth gloss of the stones and Indian lampwork beads and the rough quality of the magma beads. This bracelet is for my sister. She wanted something in turquoise. She hasn't seen it yet and I am not sure if she'll like it as it's quite unusual. 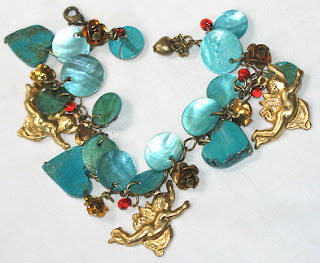 I've used gorgeous (real) turquoise hearts, turquoise shells in two sizes, little vintage golden roses with tiny red beads inside, red Magatama drops and sweet Vintage cherub charms on a bronze chain. 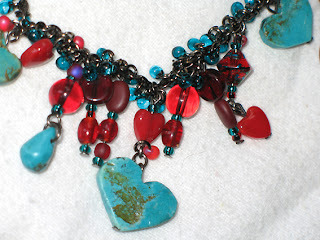 Red and turquoise is one of my favourite combinations. Each colour makes the other more intense. The gold/bronze gives it a warm glow. 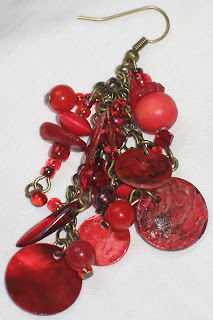 Very different from another one I made (which I, again, made for myself and then ended up letting my friend have - the same friend as the one I mentioned above), although the colour combination is similar, but the chain and findings on that one are black plated. 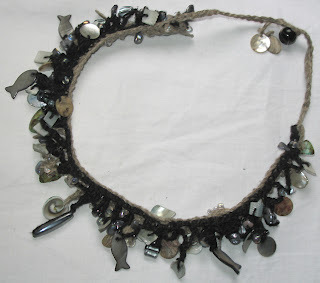 Here's a picture of the other necklace if you're interested: Corazon (a couple of topics down from the top). This crochet lark is quite fun and it gets my creative juices flowing. I've been having fun trying out new techniques and occasionally inventing my own technique. The first lot are all based on the tubular design I've used previously. However, I have been more inventive with colours and also with the actual tubular design by making it more organic. See for yourself. 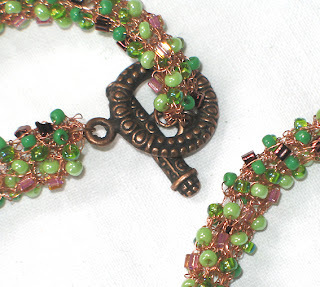 Fairy Glen necklace: I've used copper wire with seed beads in different shades of green and copper and coppery pink. 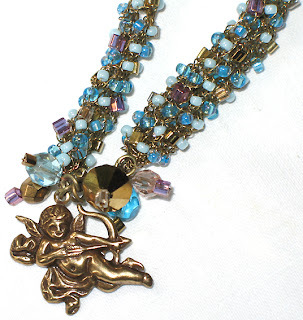 Cherub necklace: This necklace was inspired by a Italian church I saw on TV. 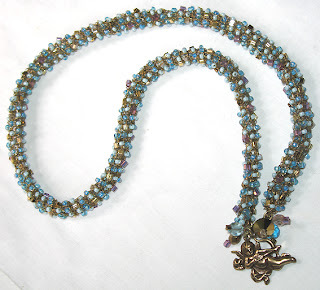 I've used seed beads in different shades of light blue with lighter and darker gold and a few mauve, gold lustred triangle beads added into the mix. 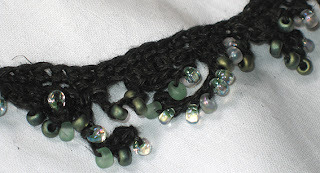 Here's a detail of the clasp and the beads. 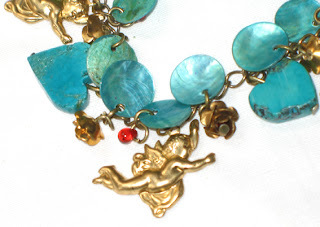 The necklace is opened at the front with vintage beads and a little cherub charm part of the design. Sky Blue set: This set is a birthday present for a friend. 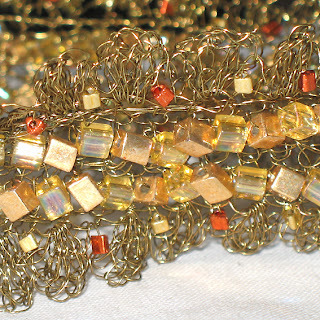 As you can see I've used the tube technique for the bracelet with pale gold, darker gold, and pale blue seed beads. 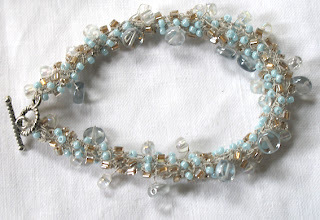 I've added some larger crystal lustred pony beads and a few smartie beads in pale watery blue, all on ivory coloured wire. The difference to previous tube designs is that I've teased out some of the beads/stitches to create a more irregular, organic look. This pendant is similar to some of the circular designs I've made before however the beads go all the way through the design rather than just the final/first row. 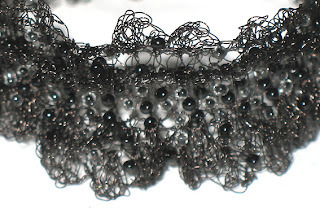 I have also created a lacy edge to it. 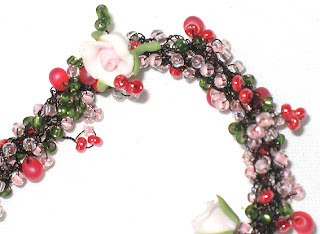 Sleeping Beauty set: Made with black wire, little fimo roses, red Magatama drops, seed beads in varying shades of pink and green. Like in the set above I've used the technique of teasing stitches and twisting them. I think it works particularly well with this design. Here's a close-up of the bracelet. 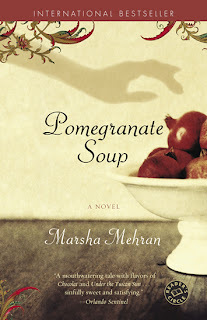 Pomegranate Delight set: This set was inspired by the cover of the book "Pomegranate Soup" (which I still haven't read). 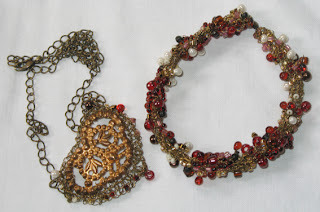 I've used a selection of Magatama drops, seed beads and pony beads in red, mauve pink, cream, gold and a few brown ones on bronze coloured wire. 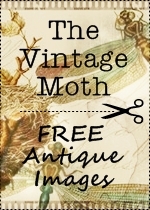 The centre of the pendant is a vintage brass stamping which I felt worked really well with the colours of the beads as it is a lovely warm colour with a soft patina. I've crochet around the stamping and emphasised the heart shape of it. 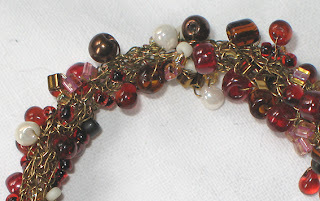 Here's the bracelet in detail showing all the lovely colours I've used. 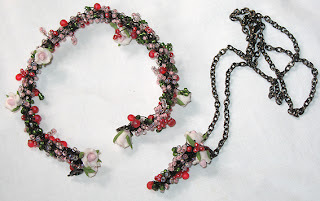 Berry Power set: This one is mine as I've sold the last red bracelet I made to a friend. :-) I am really pleased with the way it turned out. 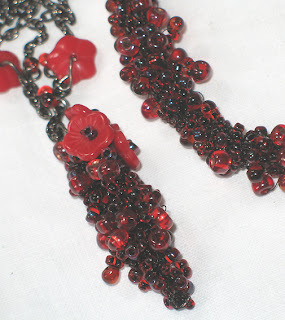 I've used lots of red beads of varying sizes and shapes and shades on black wire. I love the lusciousness of the design. A final touch were the lovely red flowers. A close-up of the bracelet and pendant. 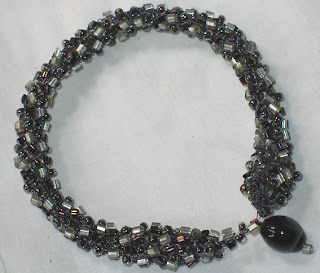 It combines black and silver beads of similar sizes and different shapes and textures in a simple tubular design. 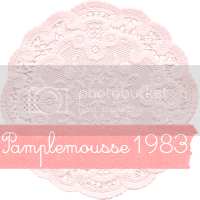 The next lot is all based on crochet lace. The bracelets below are made in similar ways but with different effects. They look great when worn and are soooo different! The first one is all in black and it looks stunning when worn. 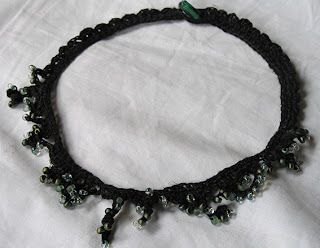 The design is based on a similar large crochet tube with added layers of lace at the edges and black and crystal/black lined seed beads. 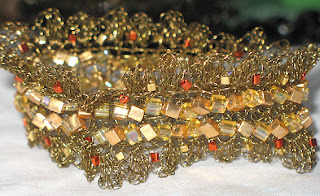 A similar design in golds and coppery metallic orange beads. 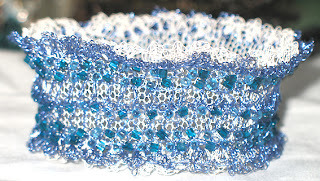 Blue and ivory lace bangle. This one is made in two layers. 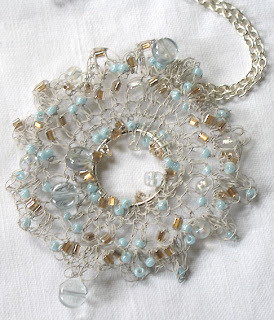 There's an inner ivory tube made of pre-knitted ivory wire and an outer tube of crochet with blue beads and blue wire. The two are combined at the edges of the ivory tube with ivory and blue lace. The bracelet can be worn either way (with blue on the outside or the ivory on the outside).